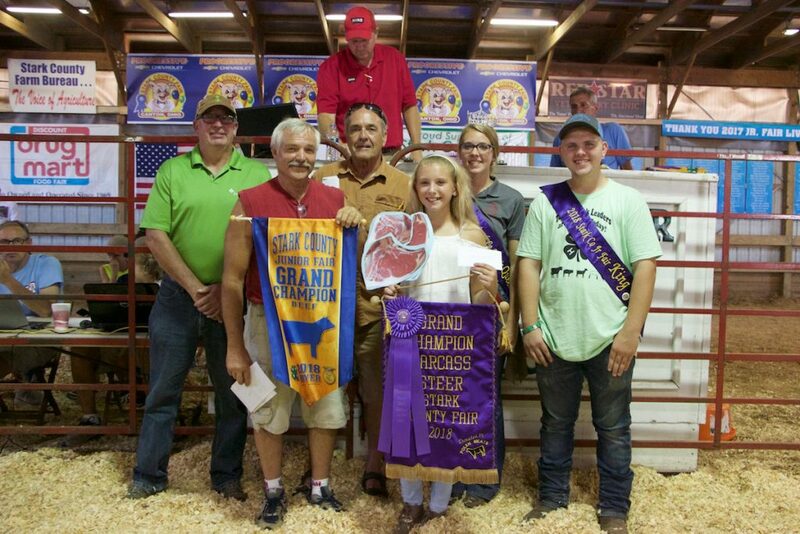 Morgan Campbell sold the grand champion dairy cheese for $6,000 to Paris and Washington Insurance, and Wallace Farms Feed & Drive-Thru. 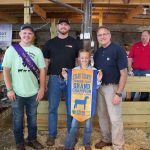 The Stark County Fair reserve champion carcass lamb, weighing 114 pounds, was shown by Kelsey Bibey and purchased by Reggie Stoltzfus for State Representative and Dustin Walder of Pole Barns Direct, for $11 a pound. 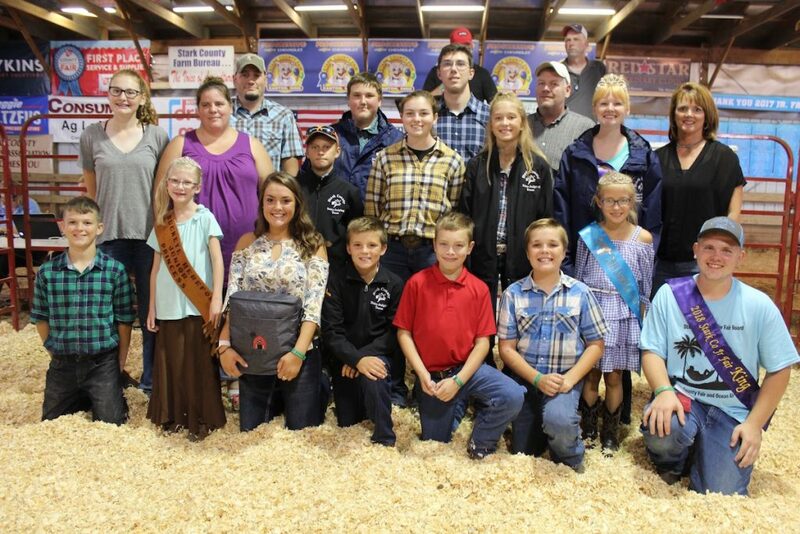 The Hamilton Insurance Agency bid $2,250 in support of the Stark County dairy judging teams. 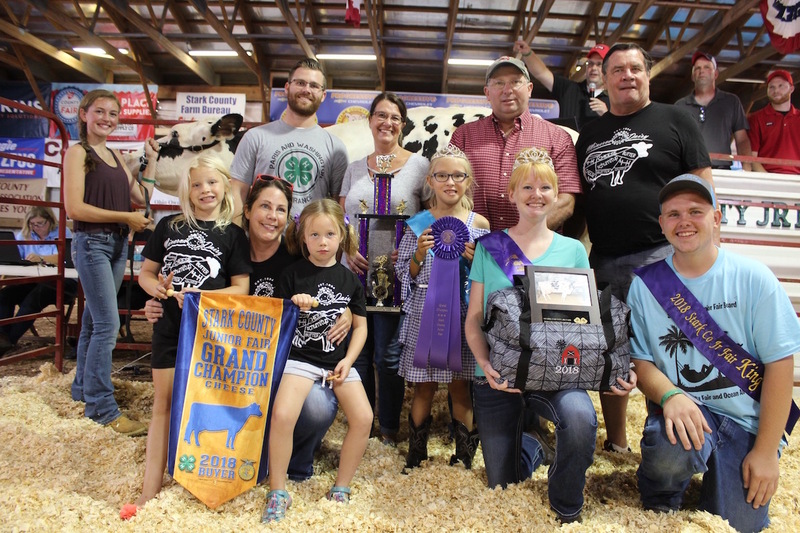 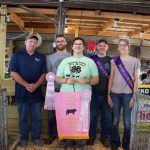 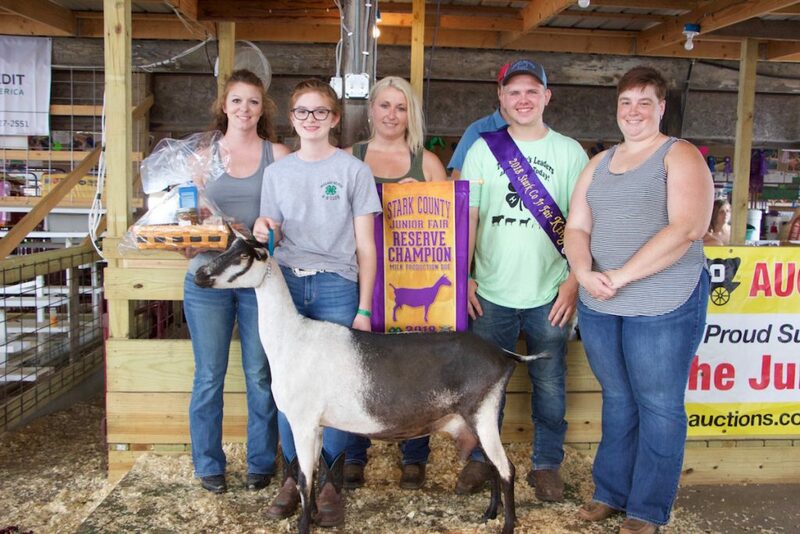 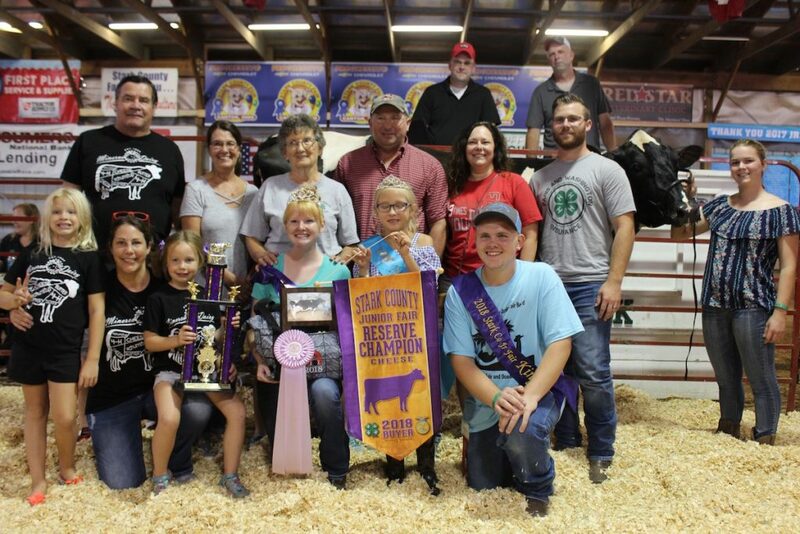 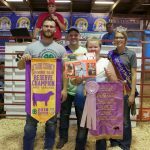 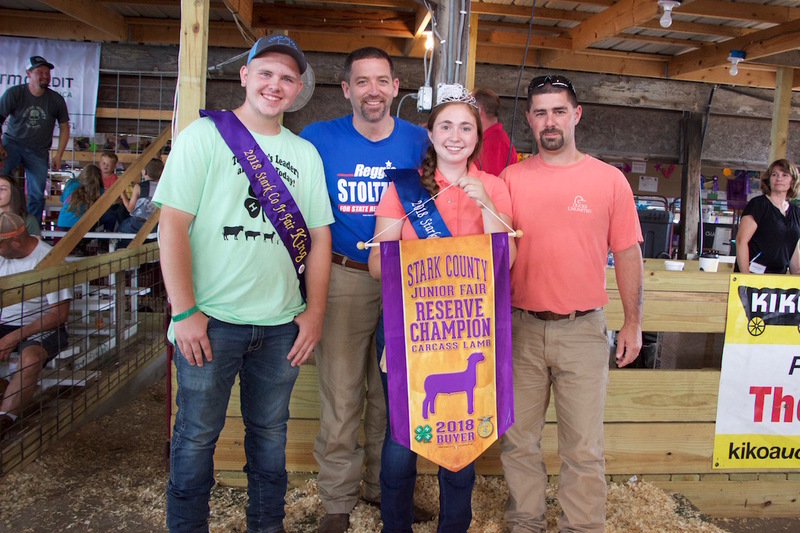 The Stark County Fair reserve champion production goat was shown by Abby Smith and the cheese basket was purchased by Farmhouse Goat Soap, Ivy Rose Dairy, A & K Livestock, and Top Secret Cattle Company for $475 a pound. 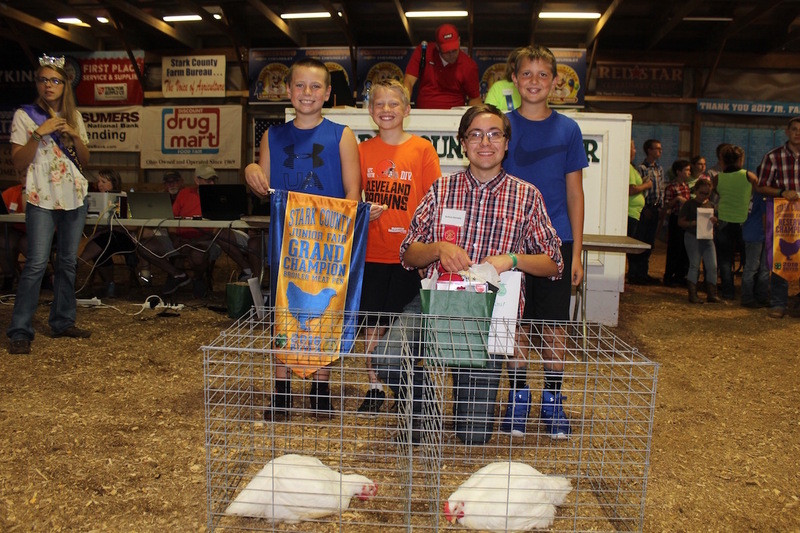 Sullivan Kennedy sold his grand champion pen of meat chickens for $800 to the Hartville Kitchen, represented by Caleb Shelly (left), Luke and Sawyer Sommers. 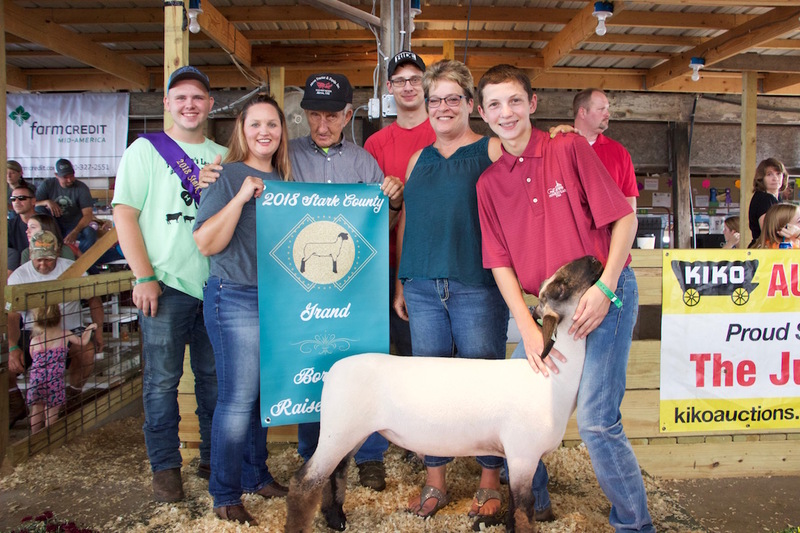 The Stark County Fair reserve champion born and raised lamb, weighing 134 pounds, was shown by Carter Varner and purchased by Navarre Animal Clinic, Still Water Farm, Umbarger Feeds and Discount Drug Mart, for $14 a pound. 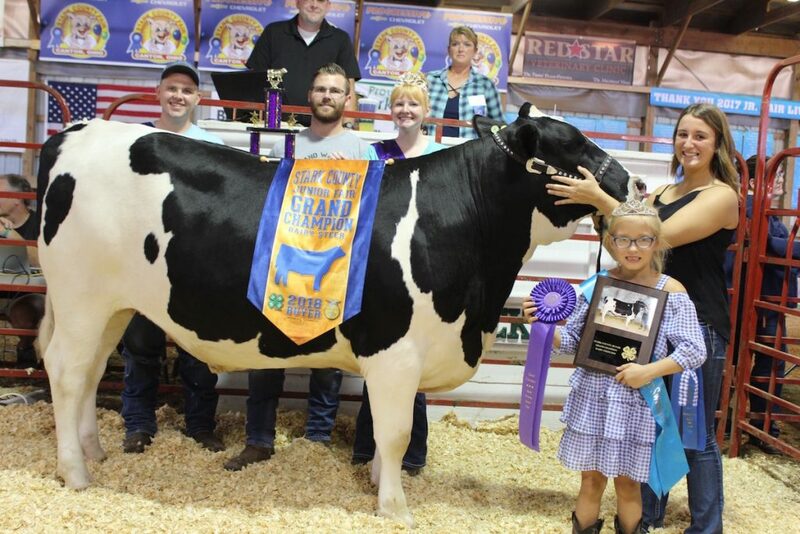 Josh Landes sold his 619-pound reserve champion dairy feeder for $2.75 a pound to Larry Krystowski, of Krystowski Tractor Sales. 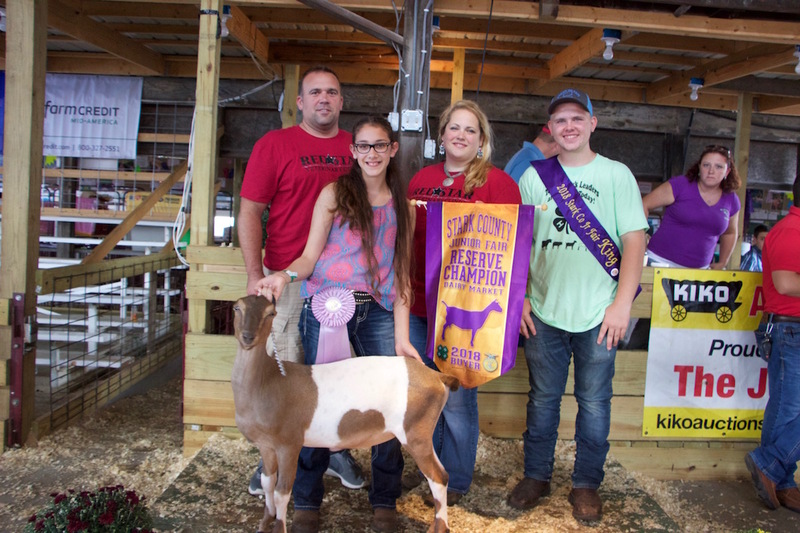 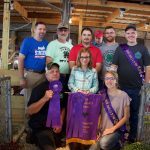 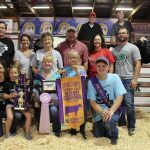 The Stark County Fair reserve champion market goat, weighing 82 pounds, was shown by Katie Heppe and purchased by Dale and Debbi Wells of Wells Family Farm for $8.50 a pound. 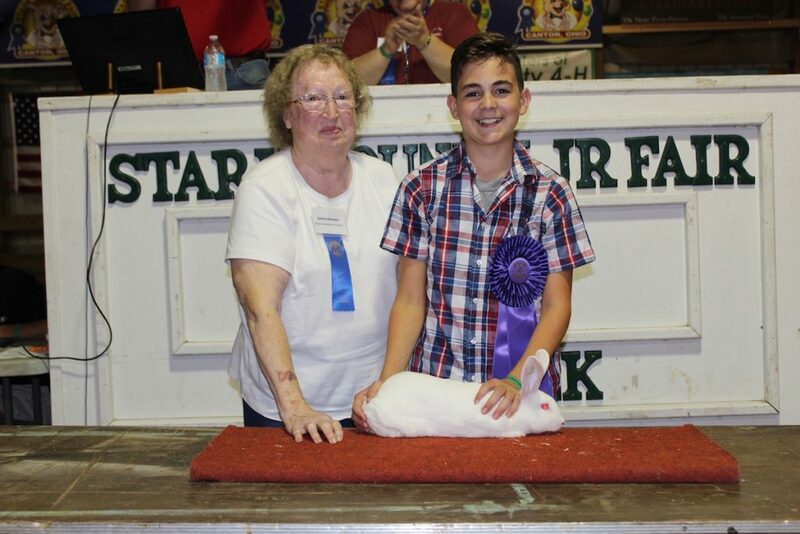 Larry Mackey sold his reserve champion pen of meat rabbits for $500 to Snyder Show Cattle, Judge Rosemarie A. 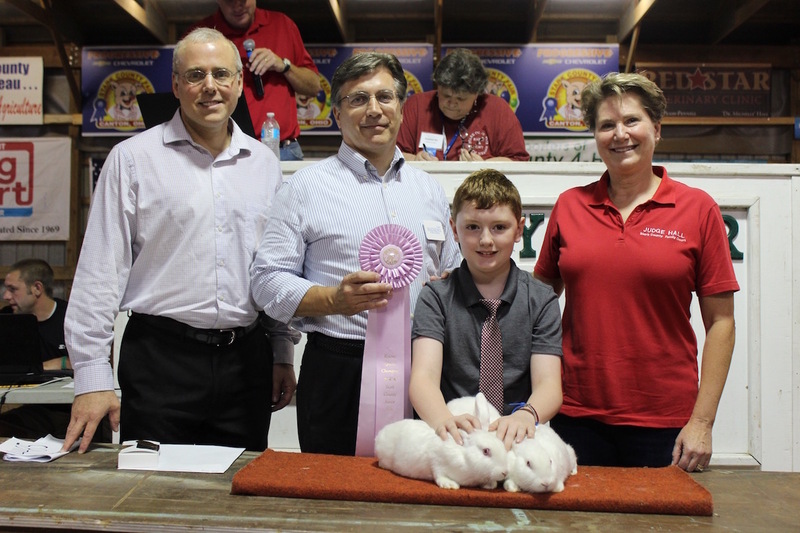 Hall (right), Matthews for Judge (center), and Judge David Nist (left). 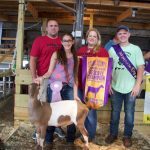 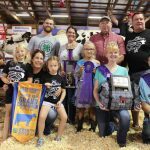 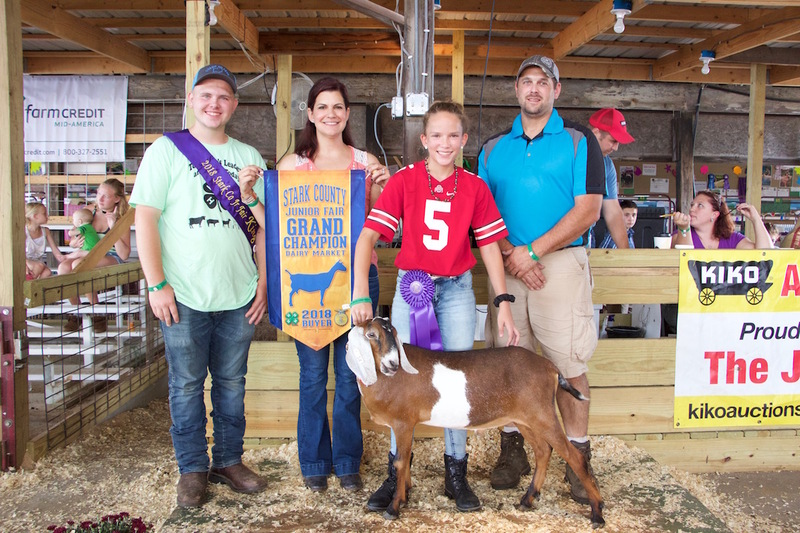 The Stark County Fair grand champion dairy goat, weighing 73 pounds, was shown by Cayla Raber and purchased by Sarchione Chevy and Still Water Farms for $8 a pound. 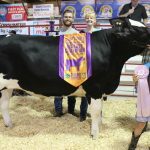 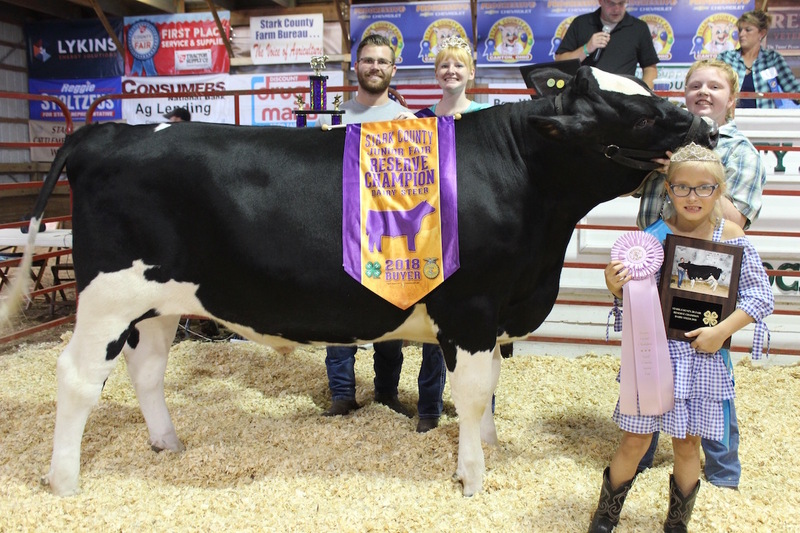 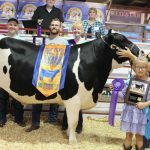 The Stark County Fair grand champion carcass steer, weighing 1,081 pounds, was shown by Alissa Lingenhoel and purchased by J Kevin Miller Plumbing, Kevin Miller Plumbing, Star Mills, D.N.K.N. 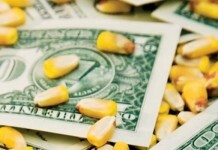 Cattle and Motts Greenhouse/Old Mill Bulk Foods for $5 a pound. 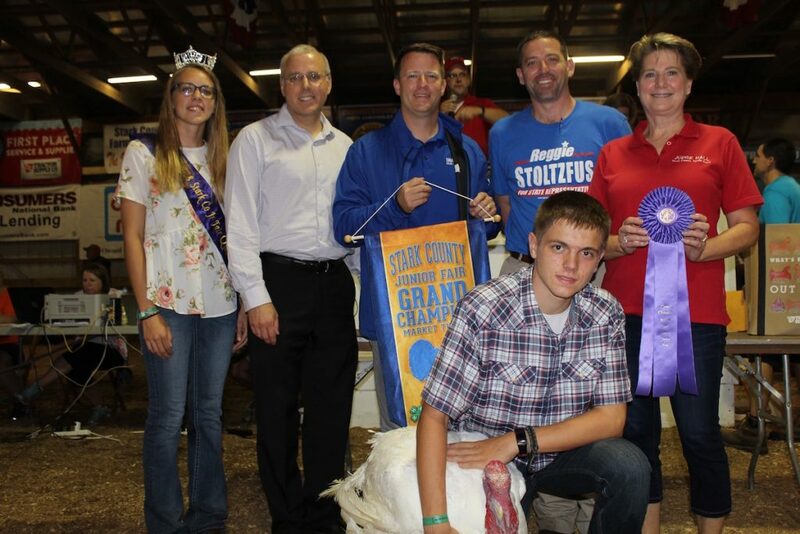 The Stark County Fair grand champion carcass hog, weighing 237 pounds, was shown by Katlynn Kiko and purchased by Hunter Palmer of Paris and Washington Insurance, Reggie Stoltzfus for State Representative, Ron Kiko of Kiko Meats, Eric and Laura Beavington, George and Becky Kiko, Umbarger Feeds and the Stark County Fairboard for $11 a pound. 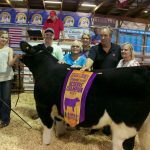 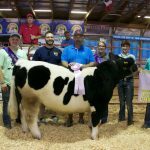 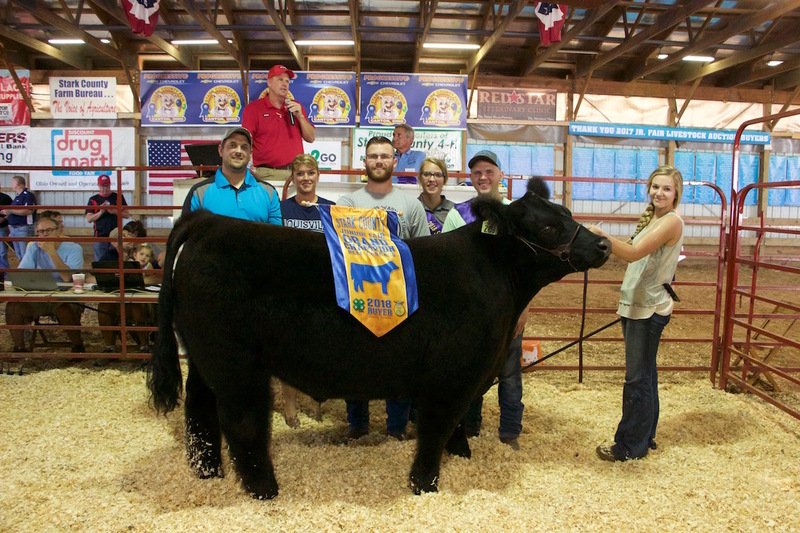 The Stark County Fair reserve champion market steer, weighing 1,255 pounds, was shown by Shayla Sancic and purchased by Wooster Building LLC, Deloris Chaney, Renee Booher and Bairs Lawn and Garden for $14 a pound. 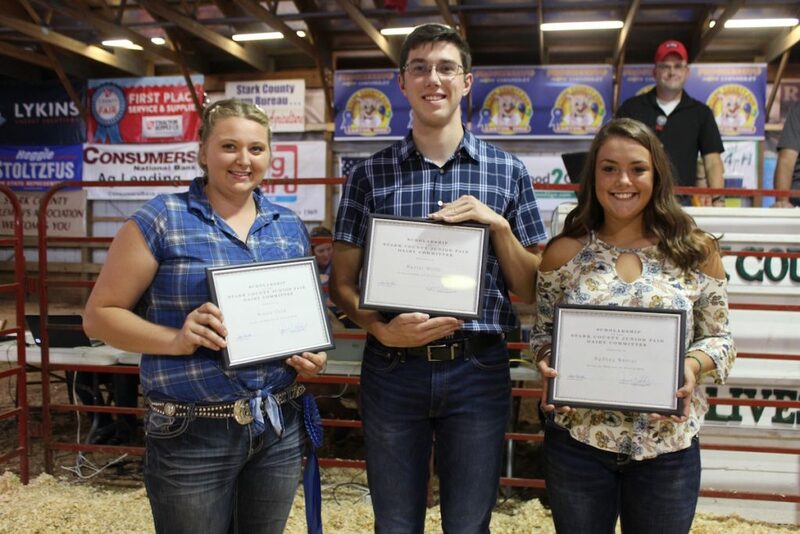 Stark County dairy scholarships, for $1,000 each, were presented to Nicole Cook (left), Daniel Wolfe and Sydney Daniel. 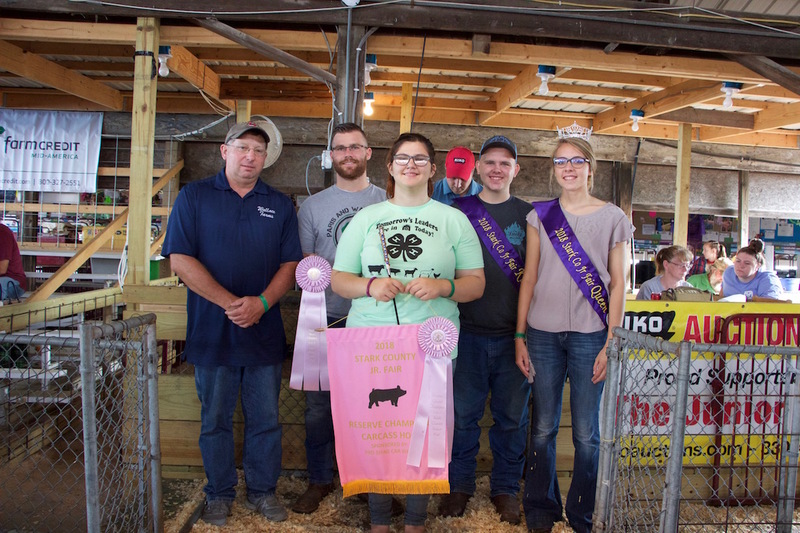 The scholarship program was supported this year by Jim and Sue Kiko. 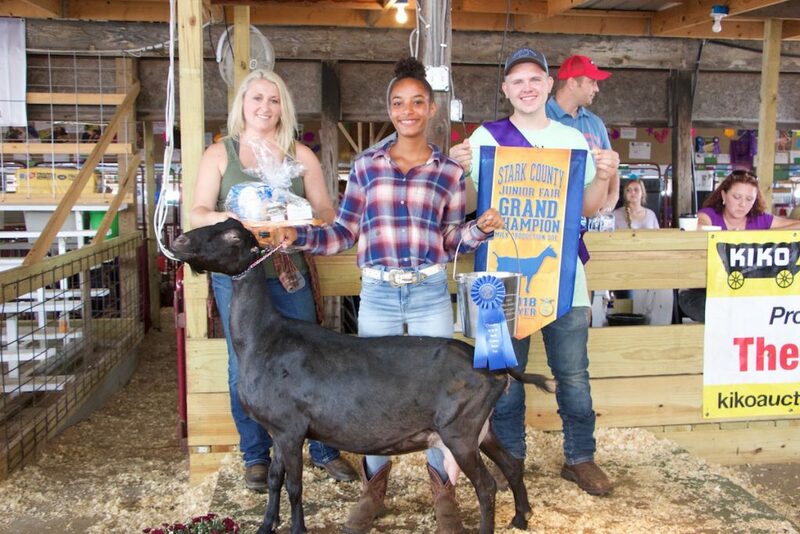 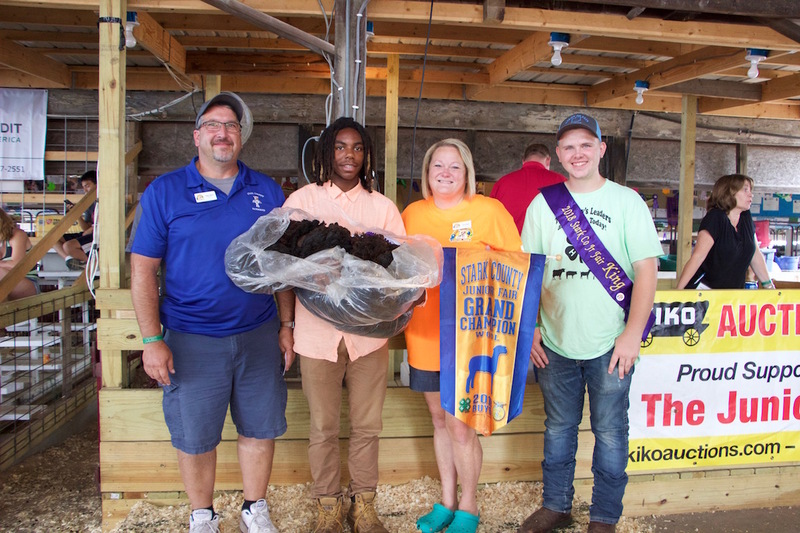 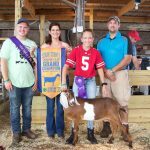 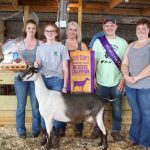 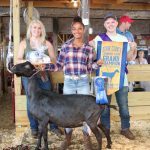 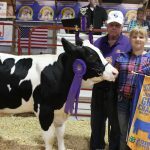 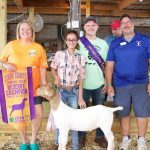 The Stark County Fair grand champion production goat was shown by Ashanti West and the cheese basket was purchased by Top Secret Cattle Company for $250 a pound. 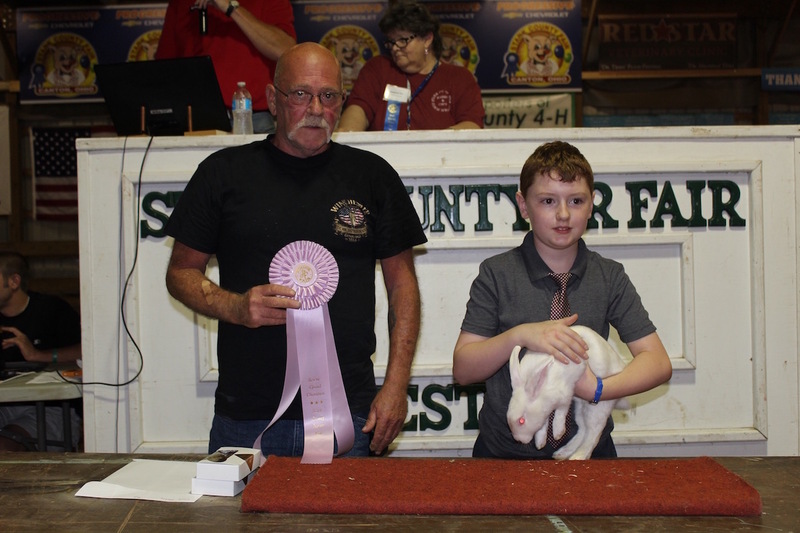 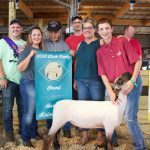 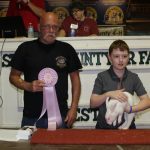 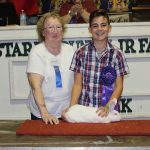 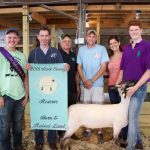 The Stark County Fair grand champion born and raised lamb, weighing 110 pounds, was shown by Mitchell Shannon and purchased by Ron Marhofer Auto Family and S&S Excavating, for $15 a pound. 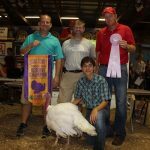 Anthony Johnson sold his 49.35-pound reserve champion turkey for $700 to John Tabellion (left); Attorney Jason Pugh for Bixler & Moore; and George and Becky Kiko. 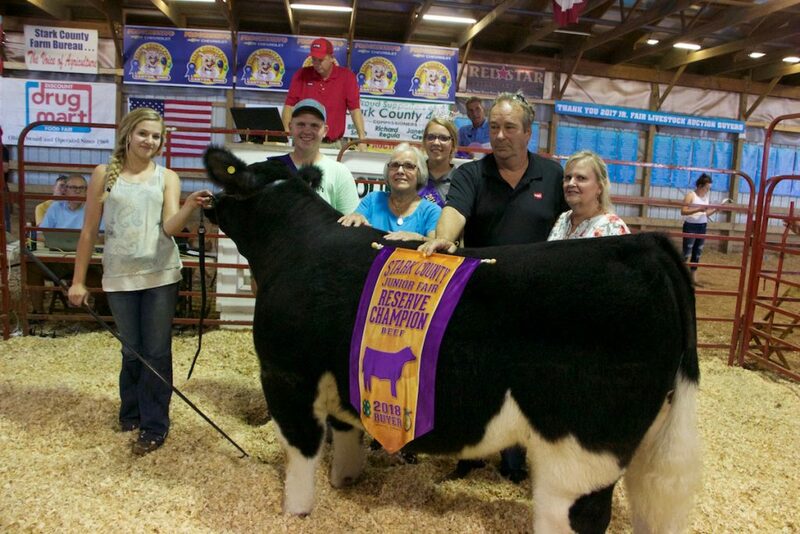 Victoria Bennage sold her 1,464-pound reserve champion dairy steer for $2 a pound to Paris & Washington Insurance. 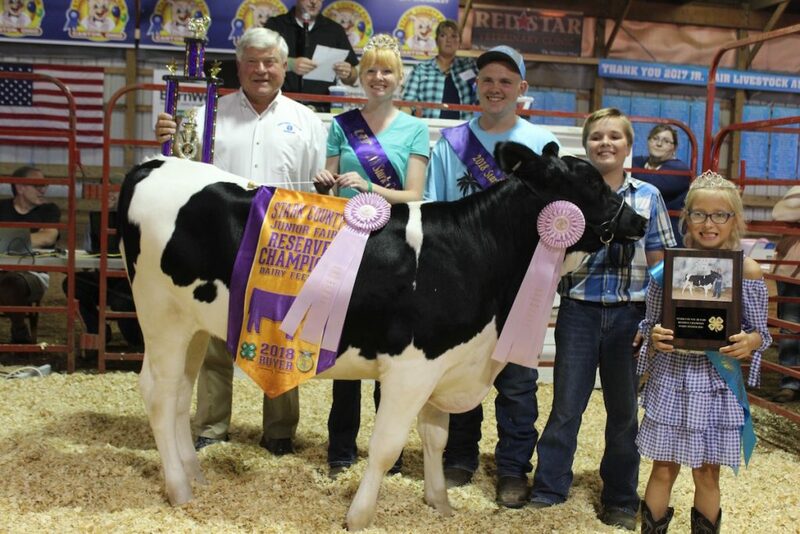 From left to right is Hunter Palmer, dairy princess Lindsay L’Amoreaux, and dairy sweetheart Kora Pero. 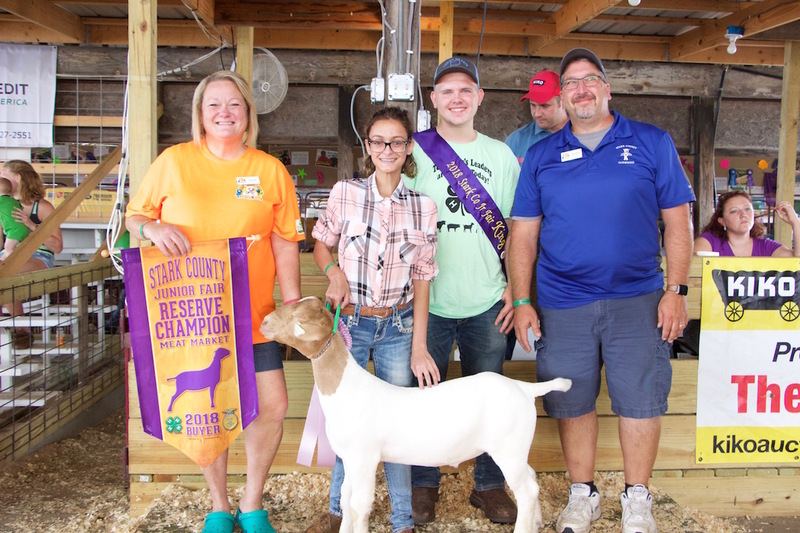 The Stark County Fair reserve champion dairy goat, weighing 80 pounds, was shown by Marli Wallace and purchased by Andy Pennell and Dr. Trish Pugh of Red Star Veterinary Clinic LLC for $3 a pound. 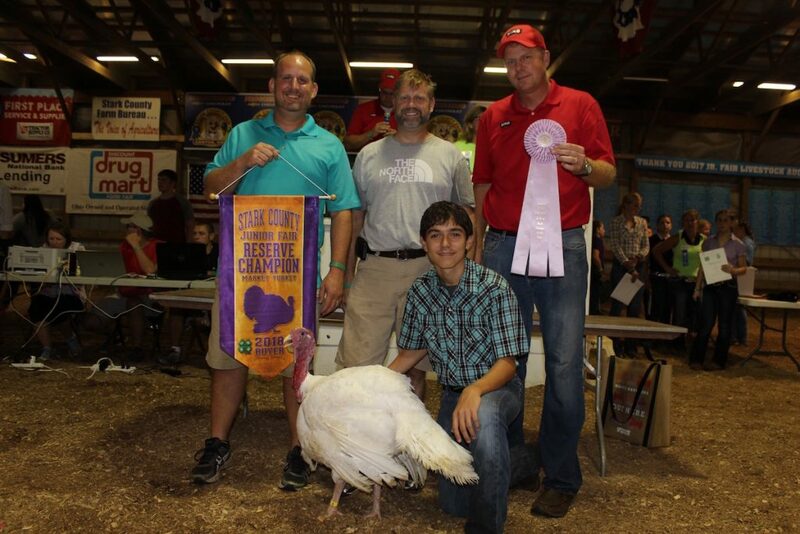 Nick Johnson sold his 51.1-pound grand champion turkey for $1,000 to Judge David Nist (left), Alan Harold/Stark County Auditor, Reggie Stoltzfus for State Representative, Judge Rosemarie A. Hall, and Judge Kristin Farmer (unpictured). Christian Pernell sold his grand champion pen of meat rabbits for $400 to Chase Snyder, of Snyder Show Cattle. 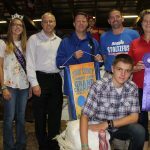 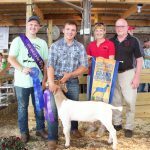 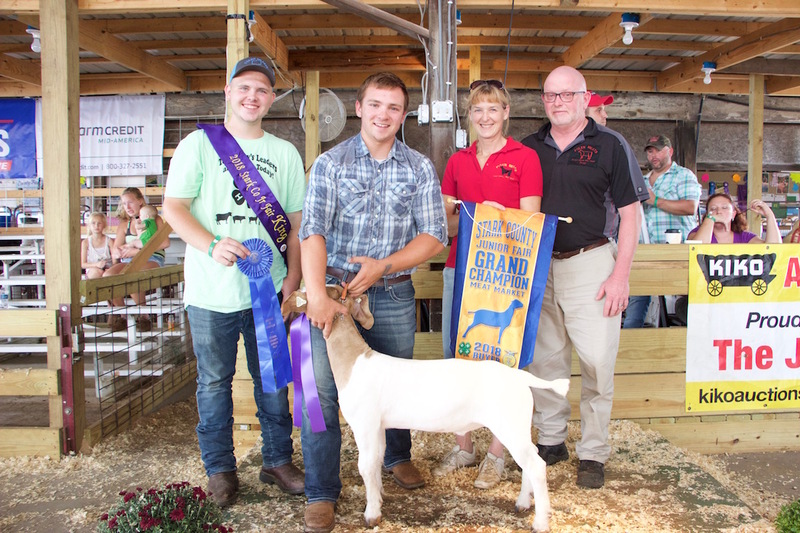 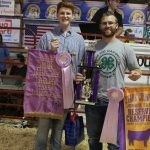 The Stark County Fair grand champion market goat, weighing 73 pounds, was shown by Andrew Heppe and purchased by Brad and Nancy Polen of Polen Meats, for $9 a pound. The Stark County Fair reserve champion carcass steer, weighing 1,296 pounds, was shown by Megan Courtney and purchased by Hunter Palmer of Paris and Washington Insurance for $2.50 a pound. 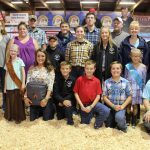 The Stark County Fair grand champion market steer, weighing 1,378 pounds, was shown by Shayla Sancic and purchased by Sarchione Chevrolet, represented by Cory and Jill Smith, and Hunter Palmer of Paris and Washington Insurance for a new record of $25 a pound. 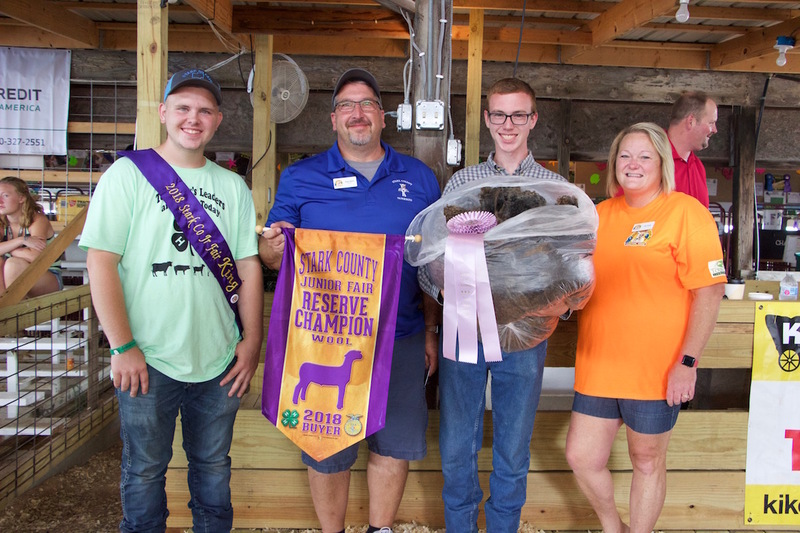 The Stark County Fair reserve champion carcass hog, weighing 240 pounds, was shown by Nicolette Finnell and purchased by Hunter Palmer of Paris and Washington Insurance, Paul Wallace of Wallace Farms Feed Drive Thru and McQuilkin Lumber Company for $11 a pound. 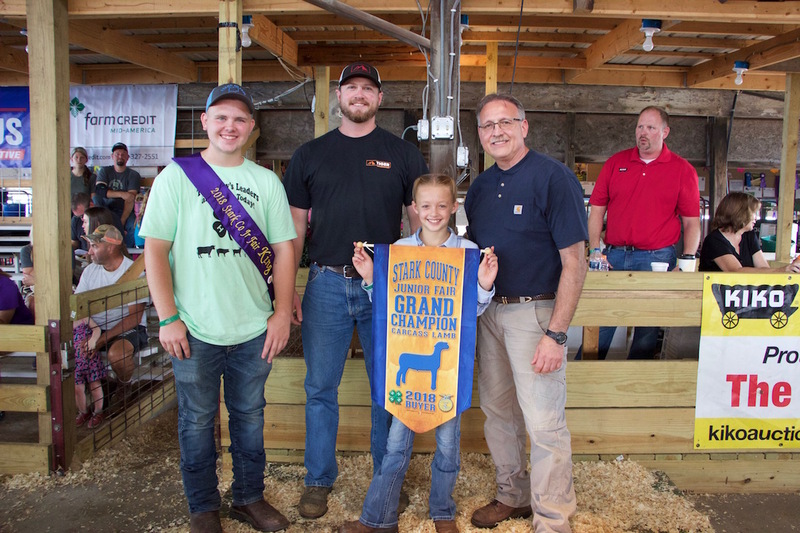 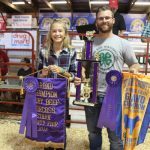 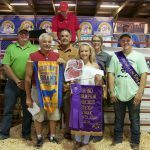 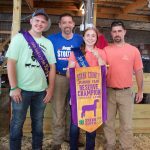 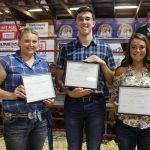 The Stark County Fair grand champion carcass lamb, weighing 114 pounds, was shown by Hailey Chenevey and purchased by Andy Ginella of Ginella Law Firm and Garrett Kloots of Papa Bears Italian Restaurant, for $15.50 a pound. 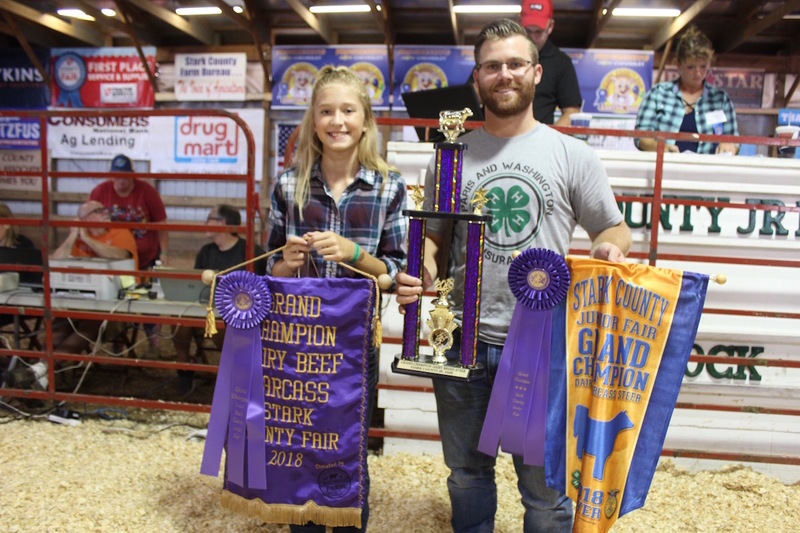 Klara Pero sold her 1,431-pound grand champion dairy carcass steer for $1.35 a pound to Hunter Palmer, of Paris & Washington Insurance. 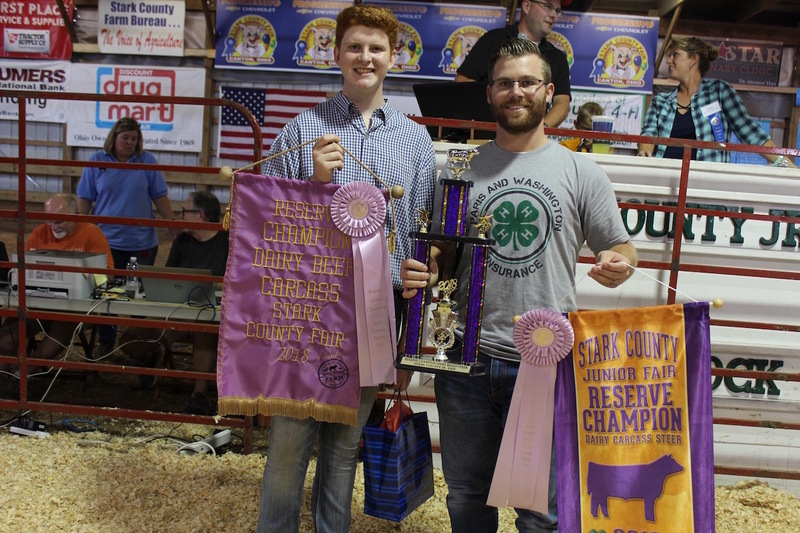 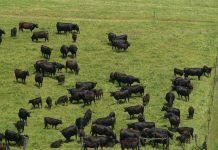 Carter Varner sold his 1,276-pound reserve champion dairy carcass steer for $1.60 a pound to Hunter Palmer, of K Palmer Insurance. 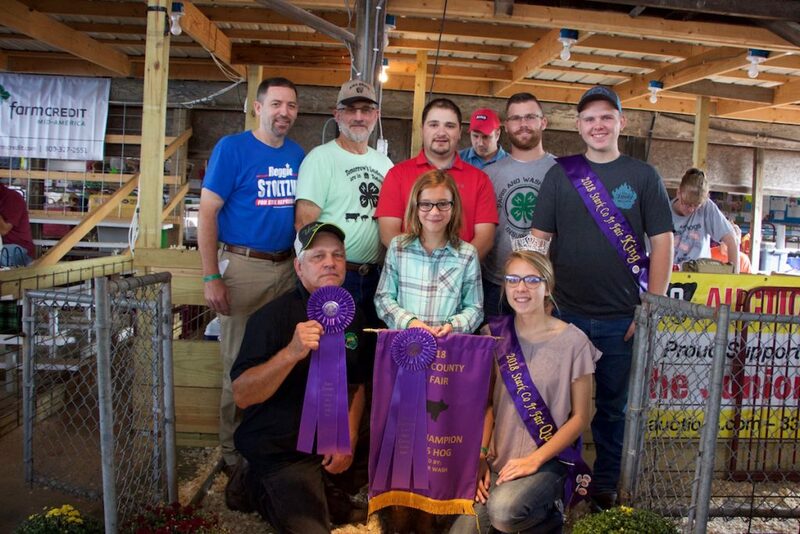 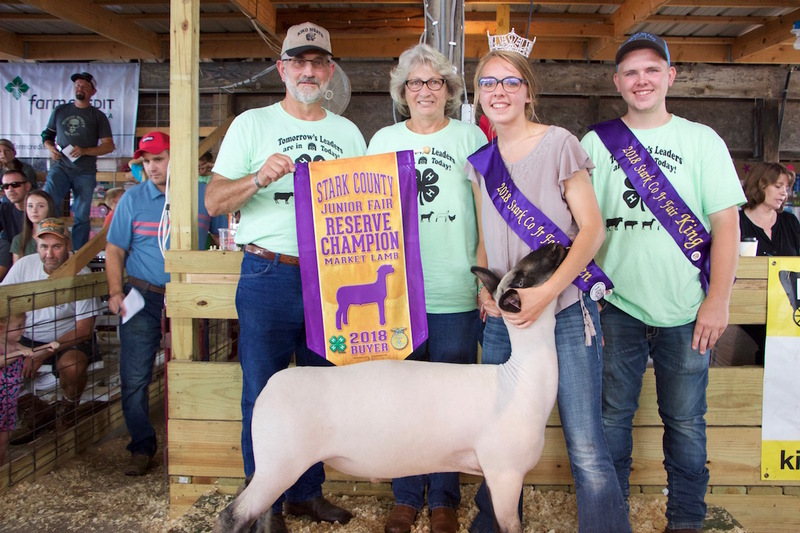 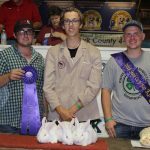 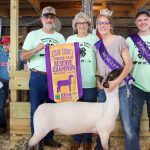 The Stark County Fair reserve champion market lamb, weighing 128 pounds, was shown by Abbie Greer and purchased by Ron and Diane Kiko of Kiko Meats for $7.50 a pound. 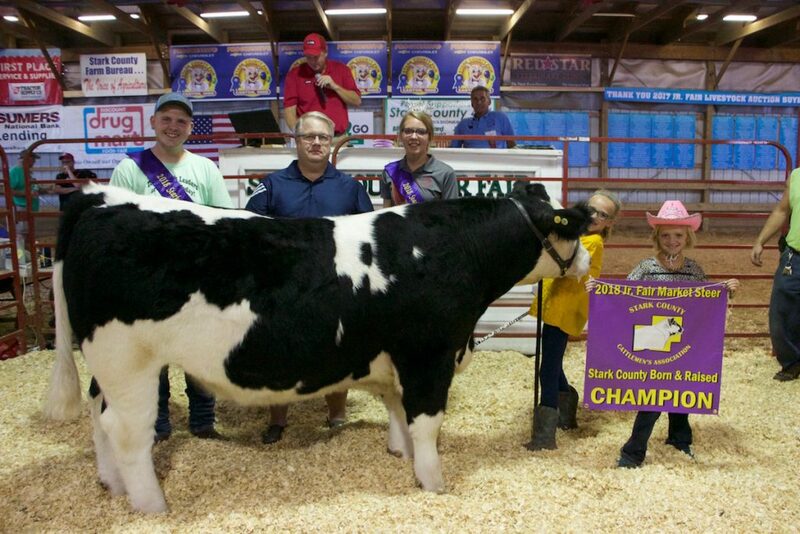 Ashley Wentling sold her 638-pound grand champion dairy feeder for $3.75 a pound to Bill Hensel, of New York Life Insurance. 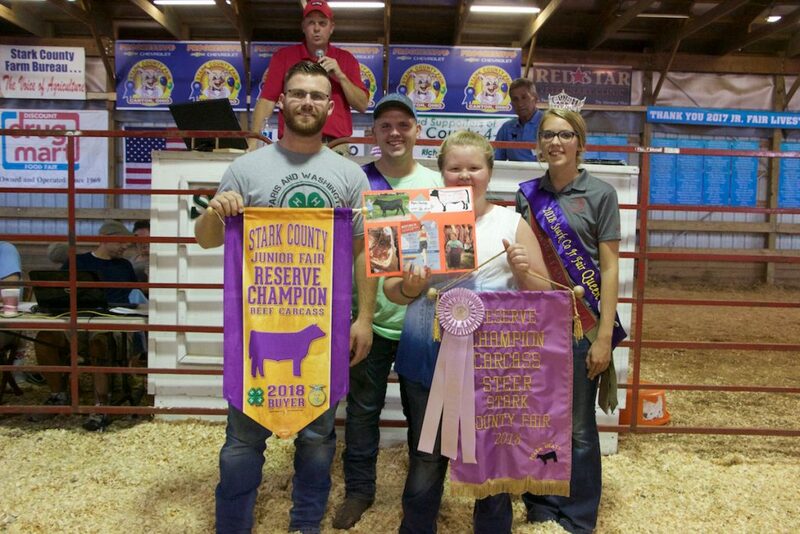 Jaclyn Kiko sold the reserve champion dairy cheese for $5,500 to Paris and Washington Insurance, Wallace Farms Feed & Drive-Thru, and Campbell Bros. The Stark County Fair reserve champion born and raised steer, weighing 1,228 pounds, was shown by JT Popick and purchased by Dr. Thomas Krupko for $2 a pound. 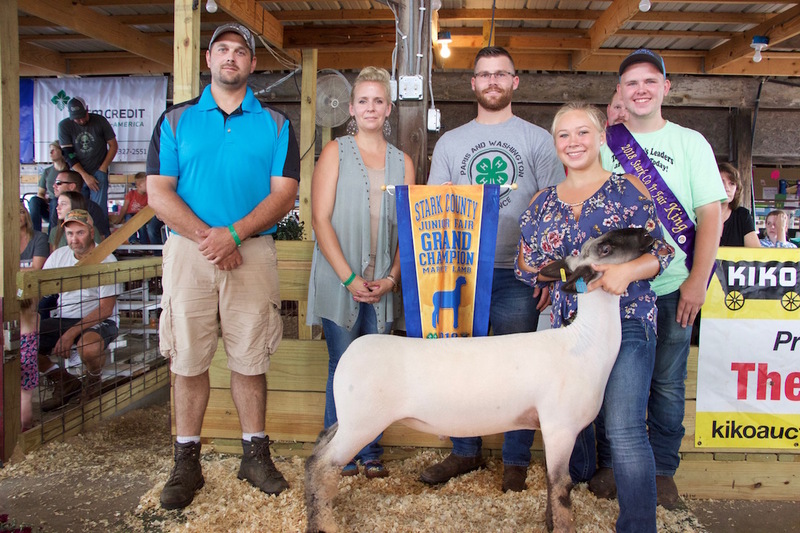 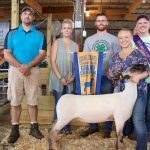 The Stark County Fair grand champion market lamb, weighing 138 pounds, was shown by Talethea Hodapp and purchased by Hunter Palmer of Paris and Washington Insurance,Sarchione Chevy represented by Cory Smith and Mandy Sancic of Olde Wood Ltd., for $20 a pound. 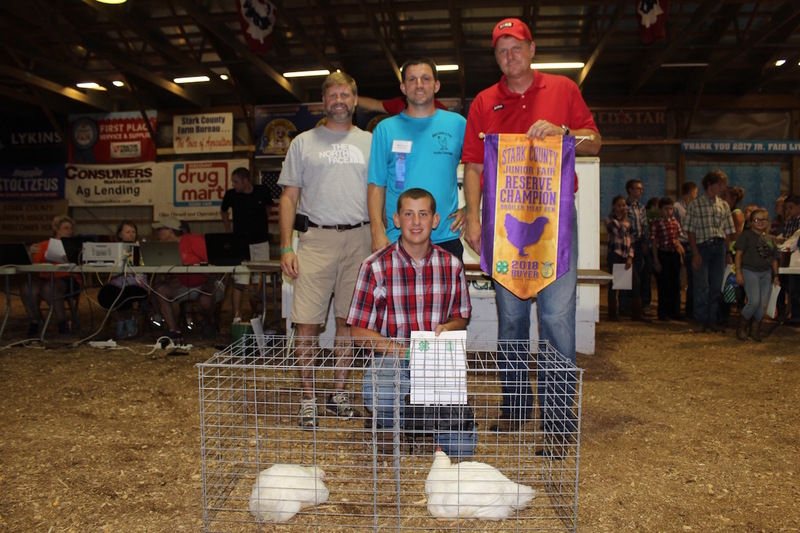 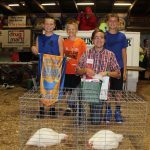 Will Tabellion sold his reserve champion pen of meat chickens for $850 to Thomas & Associates PPS; Daniel and Shelley Johnson; Jason Pugh, Atty-Bixler & Moore; and George and Becky Kiko. 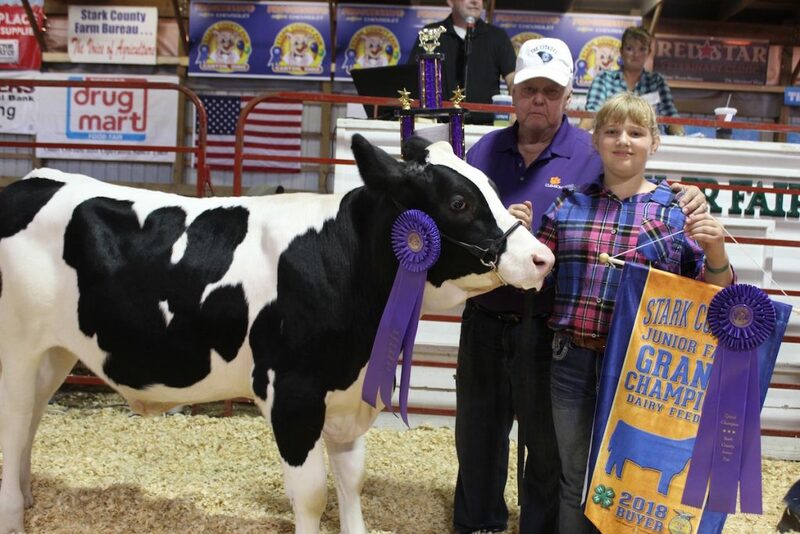 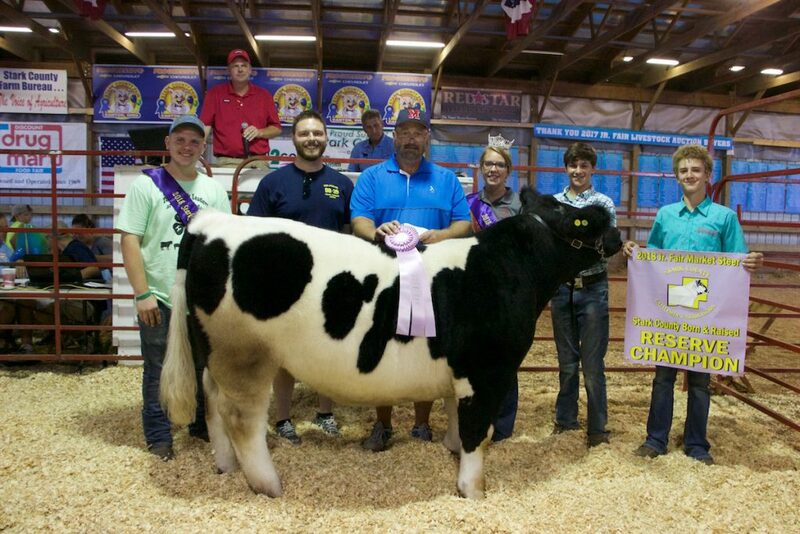 Maddie Bishop sold her 1,524-pound grand champion dairy steer for $2.50 a pound to Paris & Washington Insurance. 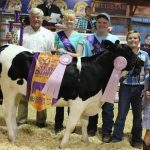 From left to right is fair king Kalob Wilson, Hunter Palmer, dairy princess Lindsay L’Amoreaux, and dairy sweetheart Kora Pero. 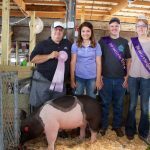 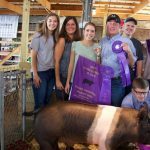 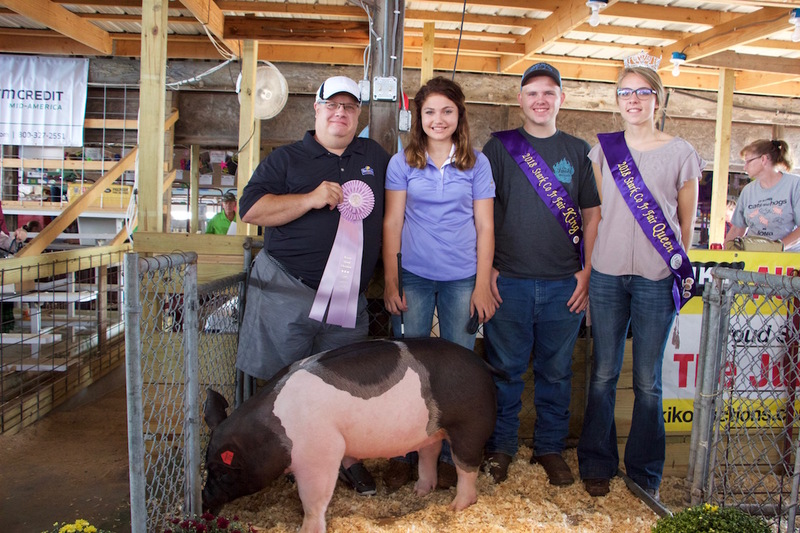 The Stark County Fair grand champion market hog, weighing 276 pounds, was shown by Shelby Lewis and purchased by Sarchione Ford, represented by Hank, Dina and Paige Lewis, for $26 a pound. 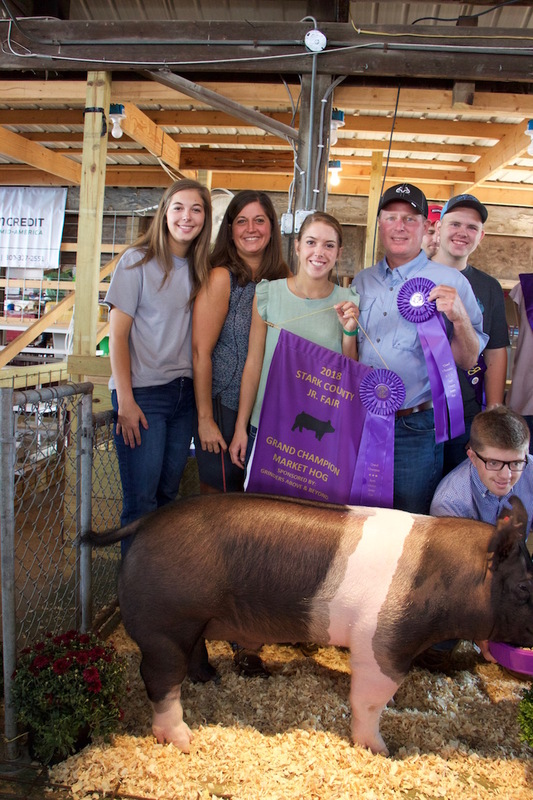 The Stark County Fair reserve champion market hog, weighing 240 pounds, was shown by Makenah Rohr and purchased by Brewster Cheese, represented by Mike Walpole, for $20 a pound. 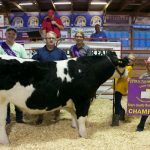 The Stark County Fair champion born and raised steer, weighing 1,310 pounds, was shown by Cora Miller and purchased by Brewster Cheese, represented by Mike Walpole, for $3 a pound. Grayson Hilderbrandt sold his grand champion rabbit fryer for $600 to Earline Hermann. 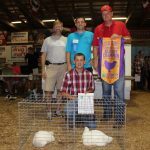 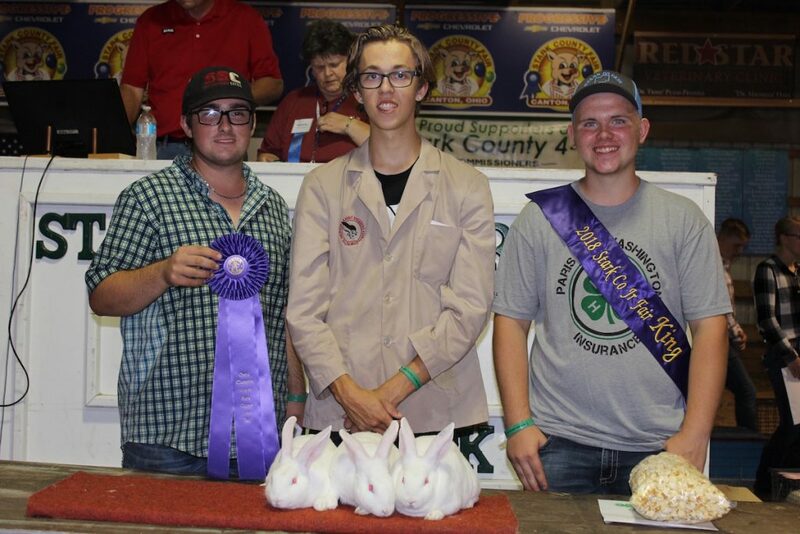 Larry Mackey sold his reserve champion rabbit fryer for $400 to Bill Roberts. 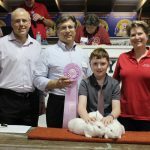 Buyer: Paris and Washington Insurance,Sarchione Chevy and Olde Wood Ltd. 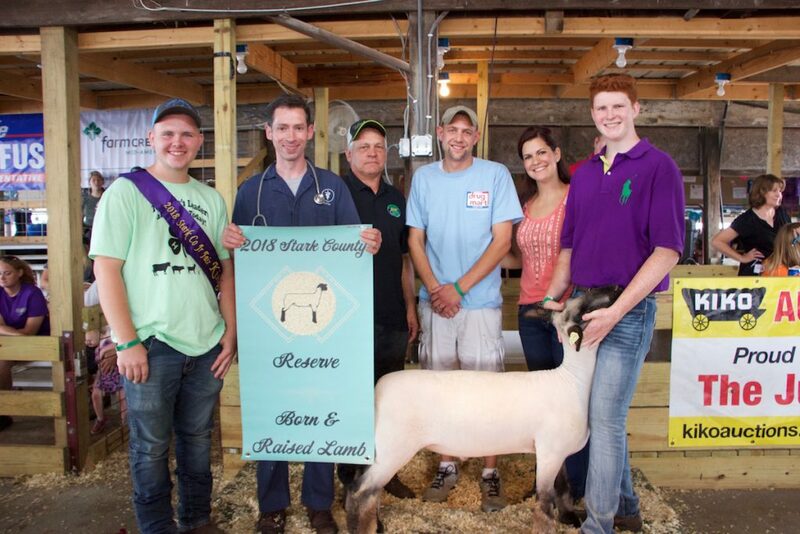 Thank you for pointing this out. 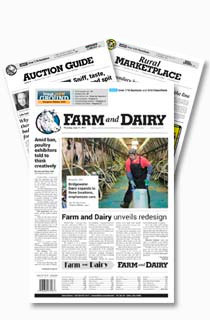 We are doing some double checking with the sale and the report that was issued. 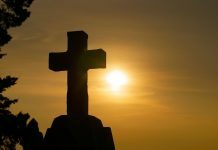 Thank you Alicia. 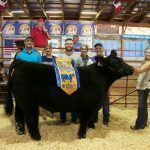 We have confirmed this with the sale organizer and you are correct. 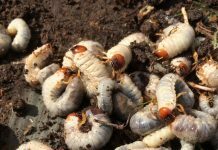 They sent us the wrong list of buyers for that entry.